Pancreatic cancer is one of the most serious of cancers. It develops when cancerous cells form in the tissues of your pancreas - a large organ that lies horizontally behind the lower part of your stomach. Your pancreas secretes enzymes that aid digestion and hormones that help regulate the metabolism of carbohydrates. Pancreatic cancer spreads rapidly and is seldom detected in its early stages, which is a major reason why it's a leading cause of cancer death. Signs and symptoms may not appear until the disease is quite advanced. By that time, the cancer is likely to have spread to other parts of the body and surgical removal is no longer possible. For years, little was known about pancreatic cancer. But researchers are beginning to understand the genetic basis of the disease - knowledge that may eventually lead to new and better treatments. Just as important, you may be able to reduce your risk of pancreatic cancer with some lifestyle changes. We still do not know exactly what causes most cases of pancreatic cancer. Several risk factors have been linked to the disease. A risk factor is something that affects a person's chance of getting a disease such as cancer. Some risk factors, such as smoking, can be controlled. Others, like a person's age or race, can't be changed. But keep in mind that having one or more risk factors does not mean that a person will get the disease. Age : - The risk of this cancer goes up with age. Almost 90% of patients are older than 55. The average age at the time the cancer is found is 72. Gender : - Men have this cancer slightly more often than women. Race : - African Americans are more likely to have this cancer than are whites. Smoking The risk of getting cancer of the pancreas is 2 to 3 times higher among smokers. About 3 out of 10 cases of pancreatic cancer are thought to be caused by smoking. Diet : - There may be a link between pancreatic cancer and high-fat diets that include a lot of red meat and pork, especially processed meat (such as sausage and bacon). Some studies have found that diets high in fruits and vegetables may help reduce the risk of pancreatic cancer. But not all studies have found such links, and the exact role of diet in pancreatic cancer is still under study. Obesity and Lack of Exercise : - Very overweight people are more likely to develop pancreatic cancer, as are those who don't get much exercise. Diabetes : Pancreatic cancer is more common in people with this disease. Chronic Pancreatitis : - This is a long-term inflammation of the pancreas. It is linked with a slightly higher risk of pancreatic cancer, but most people with this condition do not get pancreatic cancer. Work Exposure : - Heavy exposure at work to certain substances (pesticides, dyes, and chemicals) may increase the risk of getting cancer of the pancreas. Family History : - Cancer of the pancreas seems to run in some families. This may account for about 1 in 10 cases. Changes in DNA that increase the risk for certain other cancers also increase the risk of this cancer. Stomach Problems : - Having too much stomach acid or having a bacteria called H. pylori in the stomach may increase the risk of pancreatic cancer. Pancreatic cancer often is called a "silent" disease because it typically doesn't cause symptoms early on. The cancer may grow and spread for some time before symptoms develop, which may be so vague that they are initially ignored. For these reasons, pancreatic cancer is hard to detect early. In many cases, the cancer has spread outside the pancreas by the time it is found. When symptoms appear, their type and severity depend on the location and size of the tumor. Jaundice : -If the tumor blocks the bile duct so bile can't flow into the intestines, jaundice may occur, causing the skin and whites of the eyes to turn yellow, the urine to become dark and the stool to turn clay-colored. Pain : -As the cancer grows and spreads, pain often develops in the upper abdomen and the back. The pain may increase after a person eats or lies down. Cancer of the pancreas can also cause unintentional weight loss. This is often due to an inadequate intake of calories because of nausea, vomiting and loss of appetite. Digestive Problems : -Digestive problems may occur if the cancer blocks the pancreatic juices from flowing into the intestines, which help the body break down dietary fats, proteins and carbohydrates. Stools may be different than usual and appear pale, bulky or greasy, float in the toilet, or be particularly foul-smelling. Unfortunately, there are no laboratory tests available for the early detection or diagnosis of pancreatic cancer. Diagnosis is usually made after the cancer has already spread, using imaging tests and biopsy. Computed tomography (CT) scan: useful for detecting pancreatic masses and checking for metastasized cancer. Endoscopic retrograde cholangiopancreatography (ERCP): a test that uses a flexible scope inserted through the nose, stomach, and into the pancreas and may be used to introduce a dye for X-rays or to place a stent (a metal or plastic tube that can help keep a duct open and functioning). Magnetic resonance cholangiopancreatography (MRCP): a type of magnetic resonance imaging (MRI) used to see the pancreas, its ducts, and the bile ducts more clearly, often used before or instead of ERCP. Chemotherapy treatment for pancreatic cancer. Operations include the Whipple resection, distal pancreatectomy, total pancreatectomy and portal vein surgery. 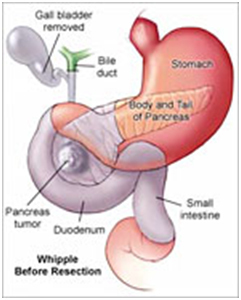 The Whipple procedure (pancreatoduodenectomy) is the most common operation performed for pancreatic cancer and may be used to treat other cancers such as small bowel cancer. 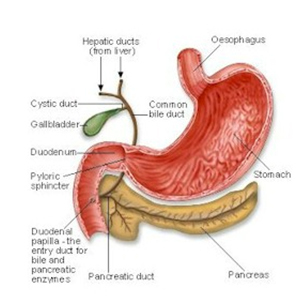 Surgeons remove the head of the pancreas, most of the duodenum (a part of the small intestine), a portion of the bile duct and sometimes a portion of the stomach. 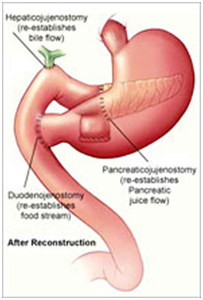 After the pancreatoduodenectomy, the surgeon reconstructs the digestive tract. Patients leave the hospital in an average of 14 days. This illustration depicts pancreatic tumor in the body of the pancreas. 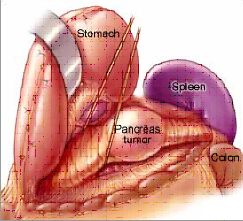 After mobilization of the spleen and the body and tail of the pancreas, the pancreas is divided and the body, tail, tumor and spleen are removed. This operation is performed to remove tumors of the body and tail of the pancreas. 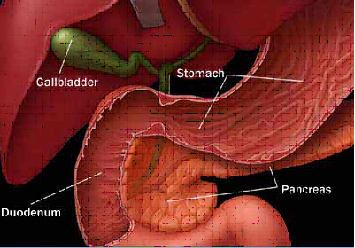 The tail of the pancreas can be removed with the main portion of the organ left intact. This procedure eliminates the need for surgical reconstruction. 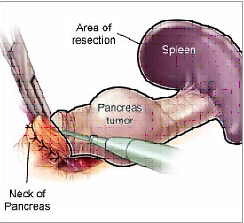 Most physicians consider pancreatic cancer inoperable if the tumor is attached to the portal vein. We Care India partner hospital is one of few medical facilities in India that offers removal and reconstruction of the entire portal vein. The capability to perform this procedure permits a larger percentage of patients who have pancreatic cancer to have a potentially curative operation.